Stickers are perfectly suitable as an advertising medium in your shop windows. You can use a mirrored sticker on the inside of the window or just attach normal stickers on the outside. Another way to go are stickers, which are readable from both sides. If you want stickers for windows which are attached to the indoor side we print the mirrored motive on a transparent foil. 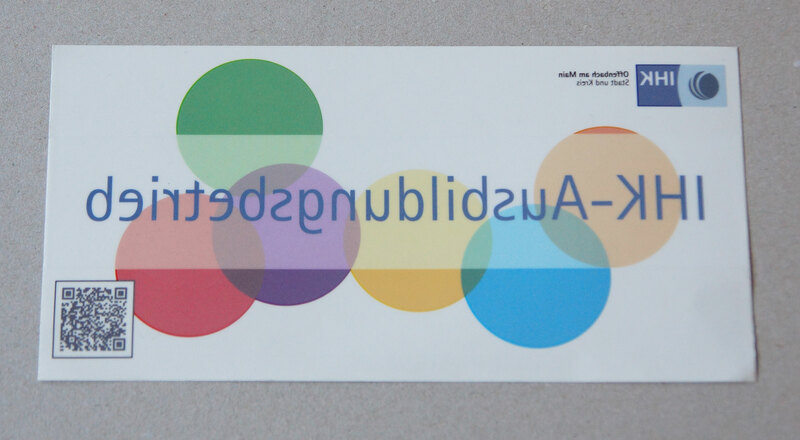 With an additional white background behind the stickers motive, it looks like a regular decal which is printed on the adhesive side of the foil. Using the sticker indoors increases its durability by far. It wont be affected by weather or vandals very much. This is the perfect solution for longterm service of the sticker. We offer window stickers with many different printing techniques. For short term problems we suggest to use offset printing. Transparent stickers manufactured using this method are weatherproof at least 10 months, if you attach them indoor even longer. The minimum order quantity is 500 pieces. If you need stickers more durable and longer lasting we offer you silkscreen or digital printing. Silkscreen stickers are weatherproof for more than 5 years and endure scratches and blows, too. Hence these stickers are the first choice, if you should need very long lasting stickers. One potential purpose is a note displaying that it is possible to pay with a debit card. Now you just have to deploy your sticker once and your customers are constantly reminded over years, that they can pay for your services with debit card. The minimum order quantity of silkscreen stickers is one piece. Digital printed stickers last longer than offset printed ones, but are not as long-living as silkscreen decals. These stickers are guaranteed weather- and windproof for more than 3 years. For this period of time every color remains fadeless. The technique of digital printing is similar to ink jet printing thus making it possible to provide very reasonably priced runs of one piece. A different possibility to paste your window with stickers are foil plots. We just take an adhesive single-colored foil and cut out the desired motif. After that the foil can be placed on any window-like surface and has very long lifespan. If you wish for single letters we die-cut those, or you favor some more complex cuts, then do not hesitate to ask. The colors, in which the adhesive foils are available, are plenty. If you have found any interest in window stickers please send us an email sticker@stickma.de or make use of our contact form. We sincerely are looking forward to give you any helpful advice regarding your choice of sticker and its printing technique.